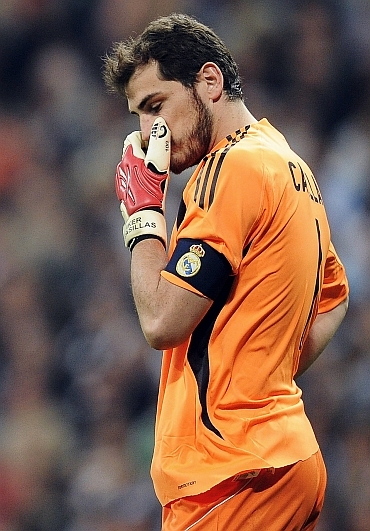 Iker Casillas does not approve of his nickname "Saint Iker" although his often miraculous saves for club and country have earned him the adoration of fans and team-mates alike. 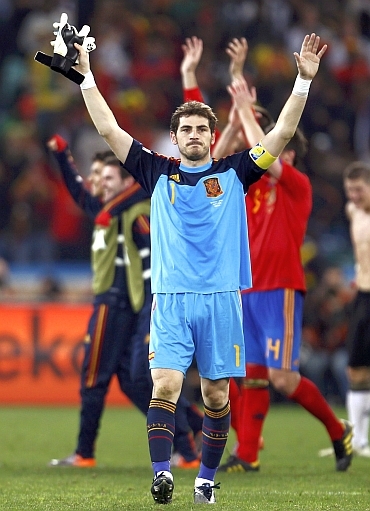 The 29-year-old Spain captain has already played 110 times for his country, just 16 short of the all-time record held by fellow keeper Andoni Zubizarreta, leading the team to glory at Euro 2008 and to the brink of a first World Cup triumph. Previously seen as underachievers in major tournaments, the Spanish had to wait 44 years to break their trophyless run by beating Germany 1-0 to claim their second European title in Vienna in 2008. 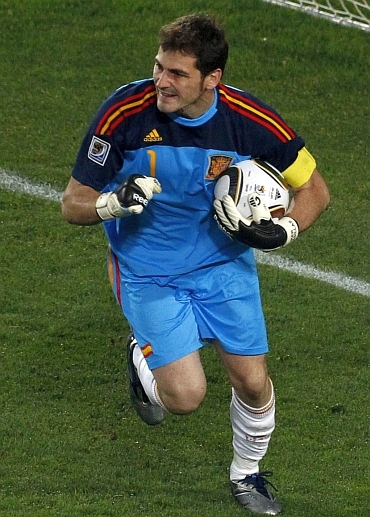 In the quarter-finals against world champions Italy, Casillas was credited with engineering what has come to be viewed as a turning point in the nation's footballing fortunes. When the match went to penalties after a 0-0 draw over 120 minutes, many back at home feared another bitter disappointment against a long-standing foe. But Casillas saved penalties from Daniele De Rossi and Antonio Di Natale and the riotous celebrations were on a par with what can be expected on Sunday if Spain beat Netherlands at Johannesburg's Soccer City stadium. Coming into the World Cup, Casillas had been under fire for his sometimes patchy form for Real Madrid last season but made another crucial penalty save in last week's quarter-final against Paraguay. The way his team-mates sprinted across the pitch to celebrate with him at the final whistle was proof of the respect and affection in which he is held. "I believe I have had good fortune in the football world," Casillas said this week, adding that he had learned a great deal from former Spain captains Fernando Hierro, now sporting director, and Raul, also Real Madrid men. "I have absorbed the best of each of them and now it's my turn as I am the veteran. I try to transmit (to the younger players) what I have learned," he added. 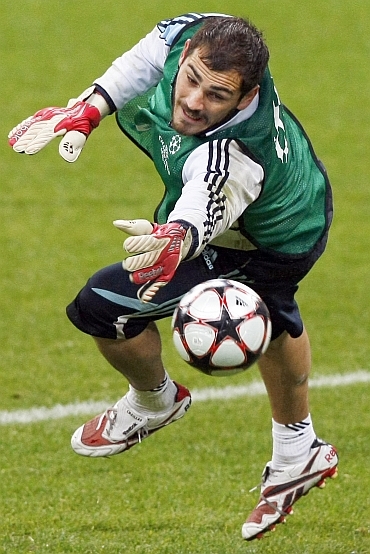 Casillas presides over a squad that is shorn of outsized egos and in which the emphasis is on teamwork, collective responsibility and harmonious relations. The players rallied round him when questions were raised about his focus due to his relationship with glamorous Spanish television reporter Sara Carbonero, who is covering the World Cup in South Africa for Telecinco. "It annoys me that the sporting press does not judge me for whether I save a ball, or clear it or if I do something badly," Casillas said. "I have never pried into the private life of anyone. I understand criticism, good or bad, as long as it is expressed with respect," he added. Asked what advice he would give aspiring footballers, he said: "Don't obsess about getting into the top division or being a super-important player. "The important thing is to work with consistency each season and then things will come together when you least expect it," he added.